Welcome to the third edition of our new monthly series on ageing in film. This month George Harvey takes a look at Up and questions what the film can teach us about ageing. You can also read last month’s article here. I’ve yet to meet anyone who doesn’t like the film Up. Even I, as a curmudgeon who usually rejects my friends’ love of the bright and shiny world of Disney, had my heart melted by this movie. Now, it must be said, I’m not entirely sure why Up manages to strike a chord while so many other animated films fall flat. At a guess, it’s a mix of simple – yet effective – storytelling, vibrant visuals, and a script that manages to elicit laughs from viewers of all ages. Which is no mean feat. Yet what I’m especially interested in today is what Up, as a film centred upon an older protagonist, can teach us about ageing – both within the film and in real life. 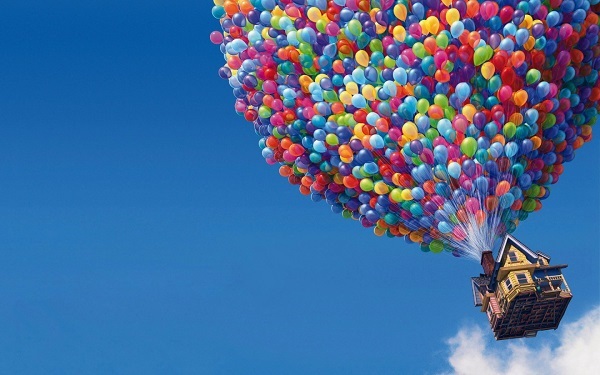 Released in 2009, Up follows 78-year-old widower Carl Fredricksen, who reacts to the council’s attempts to move him to a retirement home by attaching thousands of helium balloons to his house. Carl’s plan is simple: to fly the property to South America and therefore finally fulfil an earlier promise to his late wife Ellie. Unfortunately, things go haywire from the off, as Carl discovers an accidental stowaway – Russell, the young boy scout. It transpires that Russell, in his attempts to achieve his final merit badge for assisting the elderly, became trapped on the front porch at the point of take off. Oops. From this point on, things become increasingly hectic. Carl’s plan is simple: to fly the property to South America and therefore finally fulfil an earlier promise to his late wife Ellie. 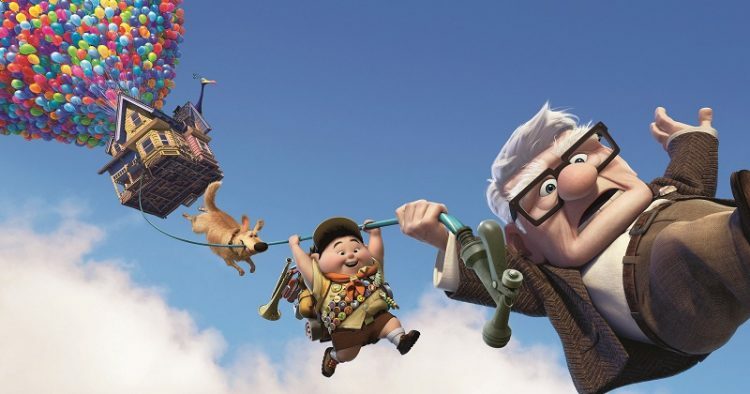 Conscious of spoiling the film, what follows is a very vague description of how the movie develops: surviving a thunderstorm, Carl and Russell encounter a large colourful bird, a talking dog, and an isolated explorer who lives on a dirigible balloon. But of course. The explorer’s attempts to capture said large colourful bird (which Russell has rather astutely named Kevin) lead the makeshift group on a whole host of adventures, including chasing a zeppelin across the South American skyline in a house powered by balloons. At this point I’m willing to admit there’s a slight chance that you may have to suspend your disbelief for some of this film. Still, we’re not here to poke holes in the plot, we’re here to discuss the ways in which Up portrays the experiences of an older lead character. 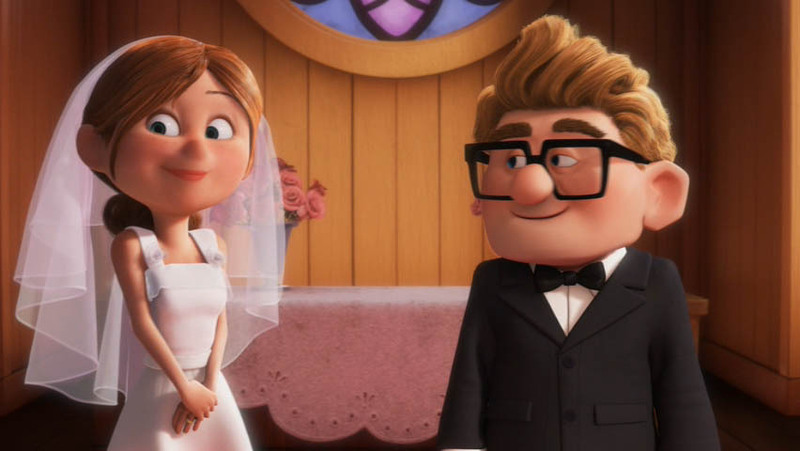 Our first insight into the life of Carl Fredricksen comes within the first ten minutes of the film, with a heart-wrenching montage that details his relationship with his late wife Ellie. This means that from the very start of the film we hold an acute sense of sympathy for Carl and the resultant social isolation he experiences in his daily life. By Age UK’s calculations, over 1.2 million older people are chronically lonely. So not only does Up focusses upon an incredibly important issue amongst older people, but the film portrays this with a tact and understanding that is all too often missing from portrayals of older characters. Up also explores the experiences of an often underrepresented group of older people – those who age without children. Within the opening minutes of the film, we see that Carl and Ellie’s attempts to have children are unsuccessful, and again the viewer is made to feel all of the emotions alongside the characters. For younger viewers in particular, there is a real opportunity to empathise with Carl and Ellie and to understand experiences that may not have given any thought to before. This differs from a high number of depictions of older characters in film. The Guardian’s film critic Peter Bradshaw has pointed out that many older figures are scripted to discuss their children or grandchildren and little else. Bradshaw also makes the point that older characters are frequently covered by what he refers to as the “Worther’s Glow”, i.e. a feeling of sentimentality and condescension. Yet Up bucks this trend somewhat through the poignant display of Carl and Ellie’s life story. Their time together is treated with respect, and Carl’s loneliness doesn’t give the feeling of condescension but rather genuine concern and sympathy. As a result, Carl’s grumpiness at various stages in the film doesn’t appear stereotypical but more a natural result of the difficulties he’s encountered. Such sympathy is heightened by Carl’s other early concern – a set of developers wish to raze his house as part of a redevelopment scheme in his neighbourhood. Eventually Carl is issued a court order to leave the property which sparks his hare-brained balloon scheme. This feeds into an issue we’ve discussed before on this blog – the effects of regeneration on older people. Certainly Carl’s solution is not one we’d recommend, but the fact the movie incudes this subplot at all again helps to give the audience an insight into the lives of older members of society and the challenges they face. Finally, Up displays that an older person can not only successfully lead a film, but they can learn and develop as a character at the same time. A recent study by the University of California found that older actors are rarely cast within the lead role of films, and Peter Bradshaw lamented the fact that older characters are often only there to impart knowledge to younger counterparts. Yet within Up this is flipped on its head somewhat, as Carl is drawn out of his shell by the vivacious Russell. By the movie’s conclusion, Carl has progressed from his earlier stubborn self and has reached a point of contentment. He even has a new friend in Russell, to whom he bestows an early gift from his wife as reward for his “volunteer work”. Now, Up’s portrayal of older characters is by no means perfect, and it still fails many of the criteria from Peter Bradshaw’s “Bechdel Test for Ageism”. However there is much to celebrate within this film, not least the ways in which it presents daily struggles for older people in a manner that a younger audience can empathise with.